I used Copic markers to color this chicken from the Technique Junkies Keep Chickens stamp set - www.techniquejunkies.com/keep-chickens-set-of-13/. I chose background paper that coordinated with the Copic colors I chose. Narrow ribbon wrapping and layers complete the card. 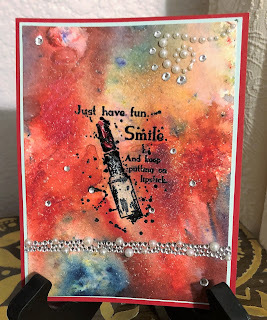 You can save 10% on this set from Technique Junkies Stamps - and everything else! - by using the discount code TJ10Judy. Go shopping. 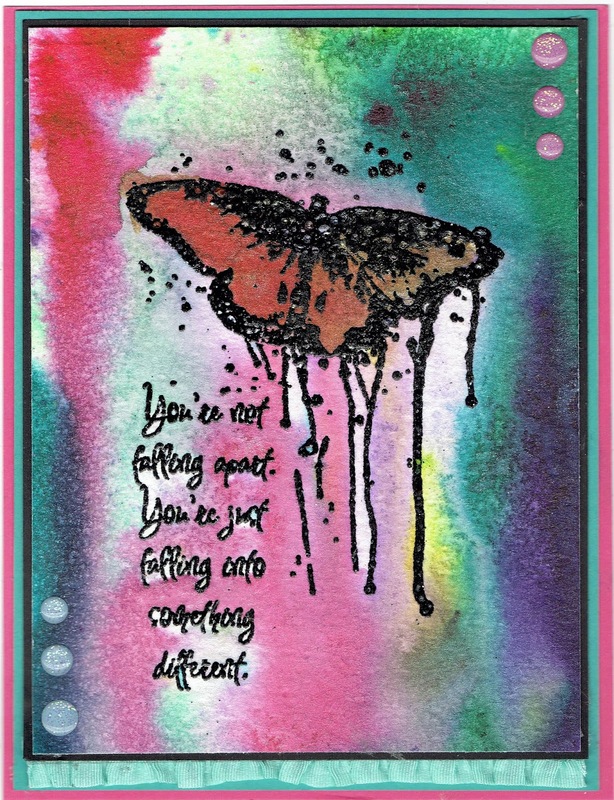 Toimorrow is a new stamp release blog hop day. Be sure to come back! 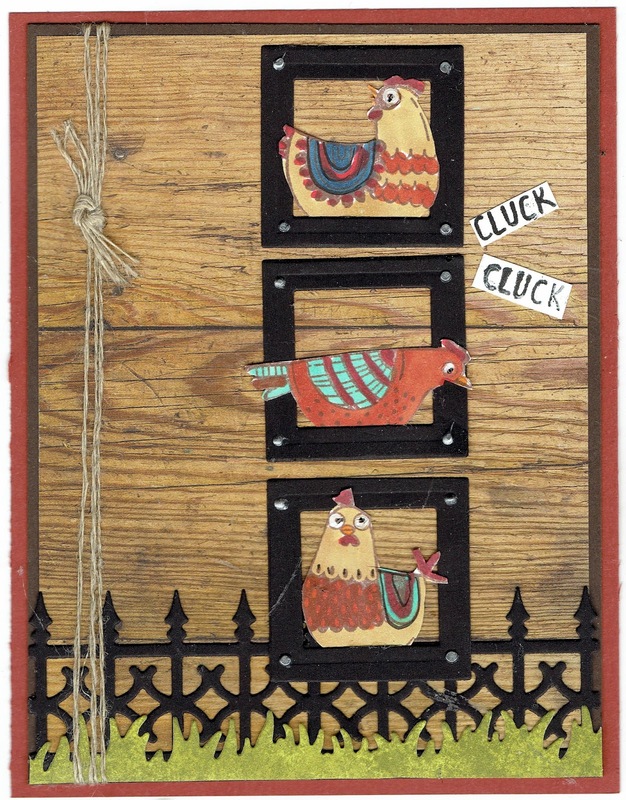 I used the Keep Chickens stamp set - www.techniquejunkies.com/keep-chickens-set-of-13/. So many cute stamps in this set! There are 13 stamps in the set - for only $24.95. And if you use the TJ10Judy discount code saving 10%, then the cost is only $22.46 or only $1.73 per stamp in the set. What a bargain!! This is a "white on white" card. The base card is white, and then next layer is also white. The eggs were randomly stamped at the bottom. The chickens were colored with my Copic markers and then die cut. Everything is popped up and layered. It is just a fun card! Every now and then a stamp set just catches your "fancy" and you just want to make a lot of cards with that set. 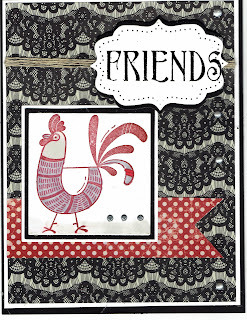 That is the case with the Keep Chickens stamp set - www.techniquejunkies.com/keep-chickens-set-of-13/ And there are 13 stamps in the set - for only $24.95. And if you use the TJ10Judy discount code saving 10%, then the cost is only $22.46 or only $1.73 per stamp in the set. What a bargain! 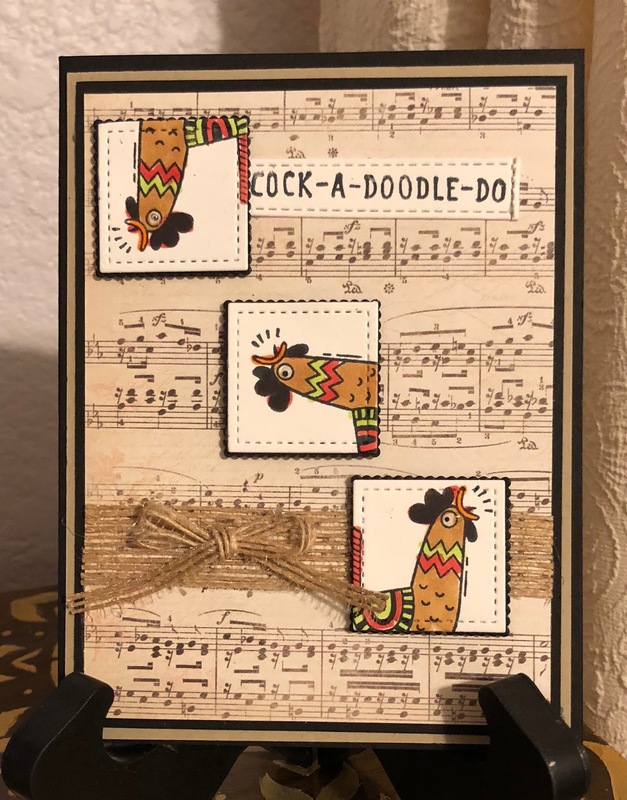 I used a music background paper, die cuts to cut out squares once I colored the chicken with my Copic markers, and some burlap ribbon.. This is just a fun card! This card was created with the Technique Junkies stamp Putting On Lipstick - www.techniquejunkies.com/putting-on-lipstick/. I stamped it with Versafine black ink and heat embossed it. The image is colored with Twinkling H2Os. I created the background with a new product to me called Brusho - which are highly pigmented powders you sprinkle on and then mist with water. I heat set the wet water color card stock, and did it again in areas where I wanted more pigment. I purchased some recently at Stamp Fest in Florida. I added some layers and pearls and rhinestones embellishments. 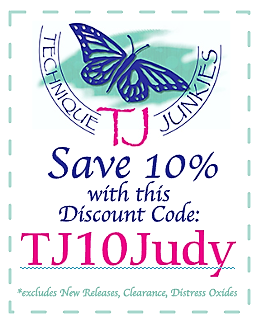 You can get a 10% discount on your Technique Junkies order by using this TJ10Judy discount code. 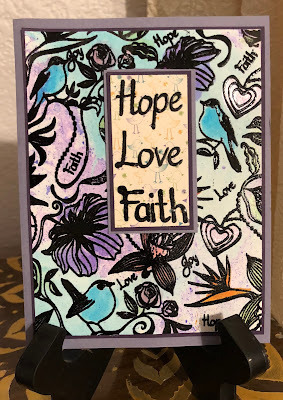 To create this card using a February release called Faith, Hope, and Love - www.techniquejunkies.com/faith-hope-and-love-background/, I first created a background paper to stamp on. I used an alcohol ink technique I learned from Jennifer McQuire. She used a glass pan with some water in it, and then squirted a few colors of alcohol inks on the surface of the water. Then you just dip card stock in the water and pull it out quickly. You get interesting designs on your card stock. No piece of car stock will be the same. You can start fresh each time, or just reuse the water and squirt a few more drops of alcohol ink in the water. And here is a tip: either use tweezers, or gloves to protect your hands or you will get some ink on your hands. But if that happens use some hand sanitizer right away to clean your hands. Most of the alcohol ink will come off before you wash your hands. And speaking of saving money -- if you use the code TJ10Judy you can save 10% even on this bundle!! Have a great day - and get inky!! 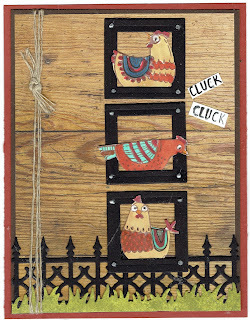 www.techniquejunkies.com/keep-chickens-set-of-13/. The chickens are colored with Copic markers. The words were stamped and trimmed and adhered separately. You can get 10% off of any Technique Junkies item (unless it is already discounted) by using the code TJ10Judy. This card uses two Technique Junkies Stamps. 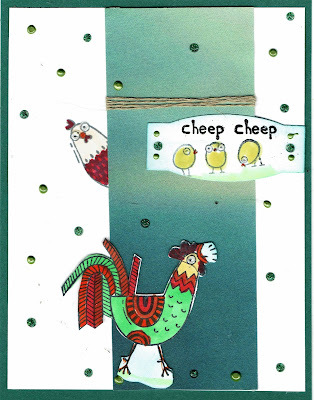 Keep Chickens - www.techniquejunkies.com/keep-chickens-set-of-13/- is from the February release and you have until tomorrow, February 8, to get 15% off of your order of all of the stamps in the February release. The Chicken Wire - http://techniquejunkies.com/chicken-wire-2/ - was just just stamped her and there for the sake of interest. The words were stamped with black pigment ink and heat embossed with detail black embossing powder. 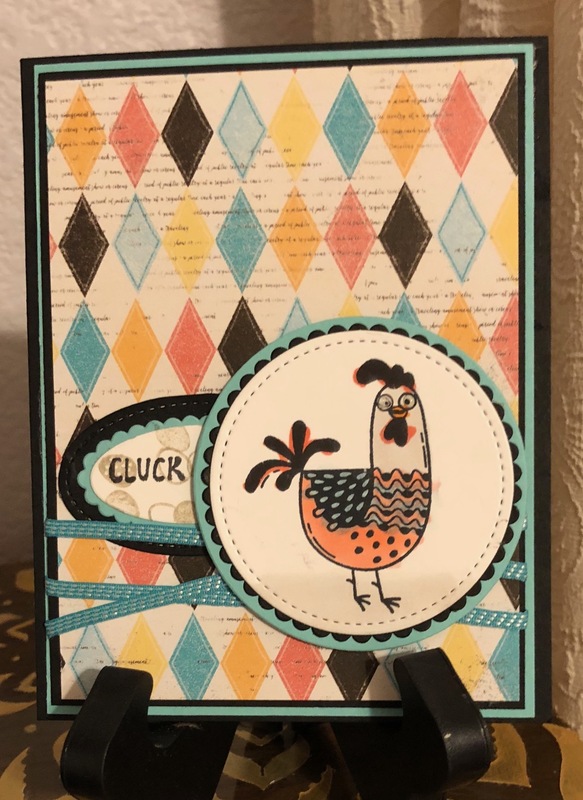 I used a small circle die and cut three random circles in the top layer and layered the chickens colored with Copic markers behind the circles in an interesting manner. 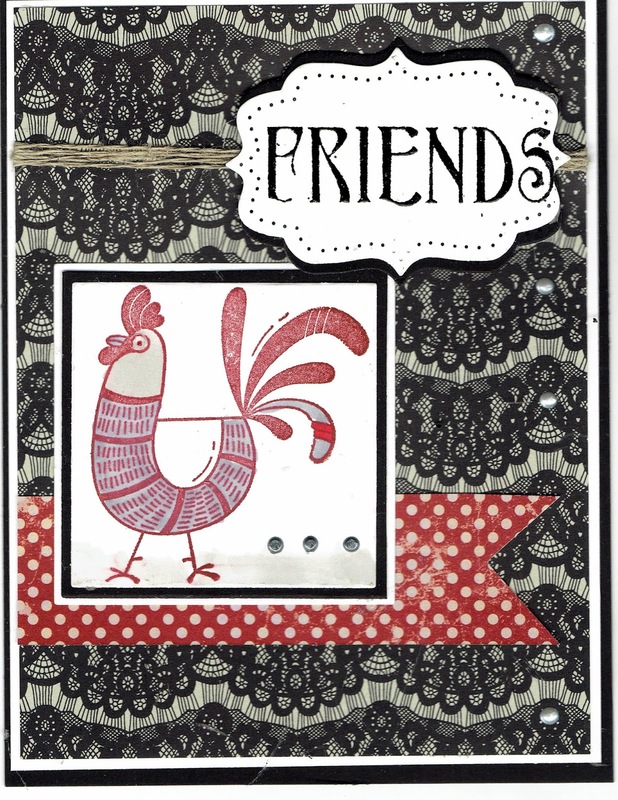 Friends and A Funky Chicken! Welcome today. 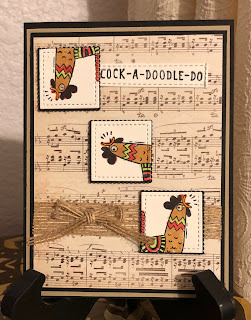 This is just a fun card that uses two Technique Junkies Stamps. 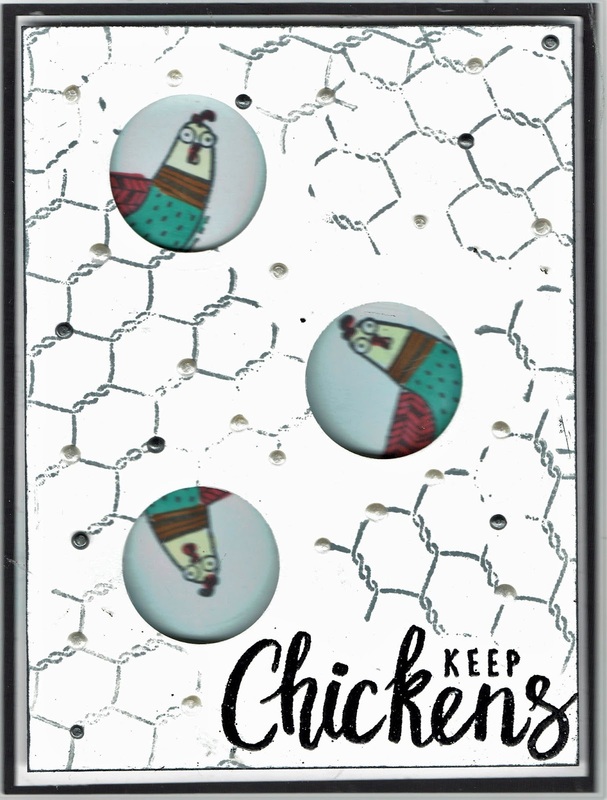 The first one is from a February release called Keeping Chickens - www.techniquejunkies.com/keep-chickens-set-of-13/, and the word is from Sentimental Sayings - http://techniquejunkies.com/sentimental-sayings/. You have until February 8 to get 15% off of your order of all of the stamps in the February release. The chicken is stamped with red ink and then colored with a red Copic marker. the distressed red and white dotted piece and the black lace are both background papers. Layers and linen thread finish the card. Wonderful February! Wonderful New Stamps! Happy, Happy!! Happy Blog Hop Day! Happy February! We have some wonderful, fun, creative new stamps to share with you today. You can see all of the new stamps here: www.techniquejunkies.com/february-2018/ . And don't forget you can save 15% off these new stamps through February 8, 2018. You can save 10% on everything else (unless it is already discounted) by using TJ10Judy. And a news flash to add to this post - Pat Huntoon has bundled the Faith Hope Love Background and Image/Sentiment set. It will sell for $23.95 (over a 10% discount) and you CAN use the 15% off through February 8, then the discount code TJ10Judy for a 10% discount after that. You should have arrived at my blog from the creative Ro Donner's blog - https://rodonner.blogspot.com/2018/02/february-blog-hoppin-with-technique.html . If not then please start the blog hop at the beginning at the very first stop on the blog hop which is The Design Junkies blog - https://techniquejunkies.blogspot.com/2018/02/technique-junkies-february-release-hop.html . The awesome Jeanne kicks off our blog hop today! 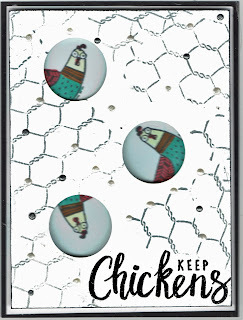 www.techniquejunkies.com/keep-chickens-set-of-13/. There are so many fun images! 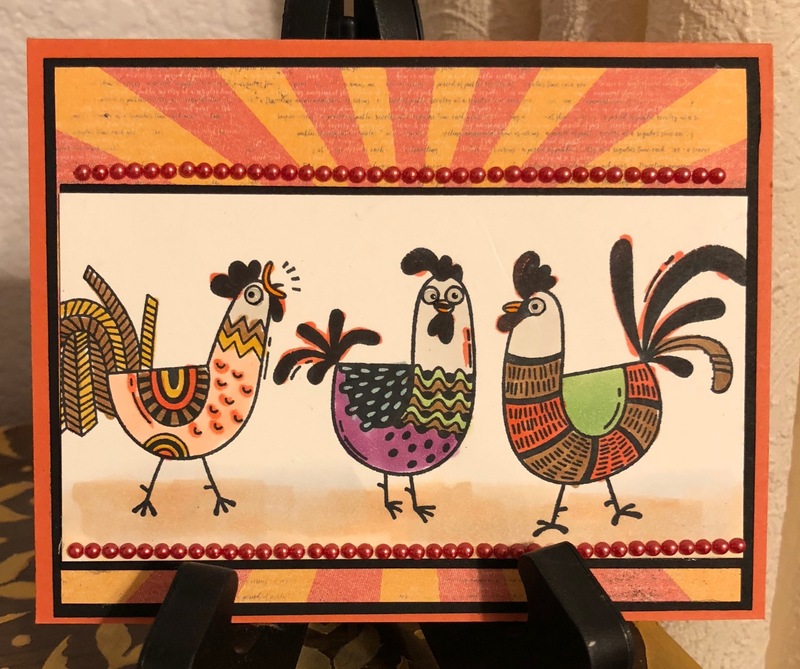 All images are colored with Copic markers, One chicken is peaking out from behind a piece of background paper wrapped in linen thread. The dots are created with Art Nuvo Crystal Drops. 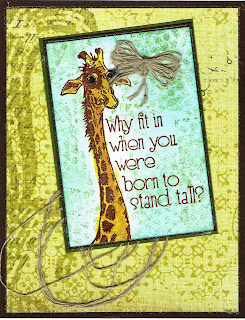 My next card uses the new Technique Junkie stamp called Something Different - www.techniquejunkies.com/something-different/. 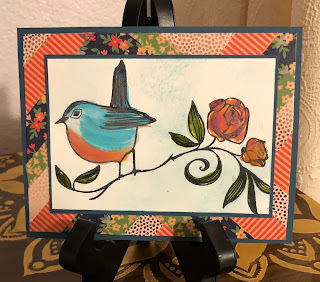 I used my MISTI - http://techniquejunkies.com/misti-most-incredible-stamping-tool-invented/ - to be sure the image was stamped nice and dark because I used watercolor paper. Then I heat embossed it with detail black embossing powder. Then I used water color inks and let it run. I then water colored the butterfly. 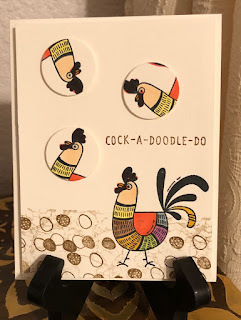 Stick-on embellishments and layering finish the card. to add some additional dimension to the background. I tied a small bow with several loops of linen thread, and created some loops from linen thread to add behind the giraffe panel. It is all layered on a piece of background paper. http://www.sunflowers-dragonflies.ca/blog/?p=58892. 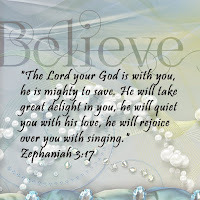 She will have something wonderful to share with you today! Don't forget that you will receive a 15% discount automatically on any new February stamps through February 8. That is a wonderful discount for sure! Then you can get a 10% discount on everything else (not already discounted) if you use TJ10Judy. Now hop along to Beth's blog - http://www.sunflowers-dragonflies.ca/blog/?p=58892. - and continue on through Pat Huntoon's blog post. I wonder what she will will use?!? Have a creative and inky day!